November 28, 2013 in Personal Stories. Having made my first visit to Kagyu Samye Ling Monastery and Tibetan Buddhist Centre with the express purpose of attending a talk by His Holiness the Dalai Lama, my second visit, a few months later, was to find out more about the Centre itself. Driving through the soft, green rolling hills of Southern Scotland one is suddenly confronted by the spectacular temple and stupa with their glinting copper roofs and steeple bedecked by a profusion of colourful, fluttering prayer flags like some exotic, psychedelic mirage rising out of the Scottish mist. 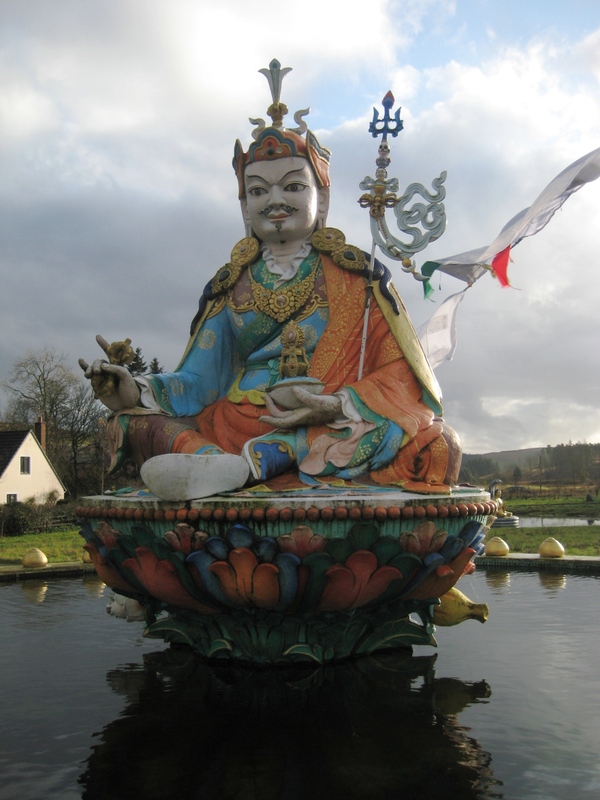 As the first and largest Centre of Tibetan Buddhism in the West, Samye Ling has grown from modest beginnings, since two young refugee Lamas acquired a rather dilapidated old hunting lodge in Dumfriesshire, to become a world renowned Monastery and Centre of Tibetan Buddhist culture with satellite branches across the globe. Its magnificent temple was built and decorated entirely by volunteer labour under the direction the Centre’s co-founder Dr. Akong Tulku Rinpoche. Entering the elaborate scarlet and gold shrine room for the first time is awe inspiring to say the least. The walls are hung with exquisitely painted Tibetan thangkas, the ceiling is embellished with silk screened panels depicting phoenix and dragons and the hall is flanked by ornately carved columns leading to the beautiful shrine at the north end where a great golden Buddha sits surrounded by a thousand and eight smaller Buddha statues. One is virtually stunned into silent contemplation by the sheer onslaught of one’s senses. After spending several days exploring this unlikely yet oddly familiar corner of Tibet nestled in a sweet Scottish valley, I was curious to meet the person behind it all and accordingly made an appointment for an interview with Akong Tulku Rinpoche. I knew nothing of Rinpoche’s status as a High Lama or any protocol surrounding such an exalted being, so when the door of the tiny interview room opened to reveal a stocky, middle aged gentleman with jet black hair and café au lait complexion dressed in plain, western style clothes I simply smiled and shook his hand. He returned the handshake and smile and gestured for me to sit down. If Samye Ling’s temple is the epitome of elaborate, sacred art its founder is a man of rare simplicity. The phrase ‘extraordinarily ordinary’ springs to mind. 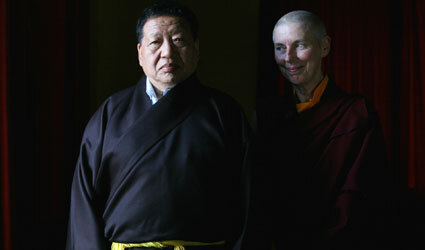 I am unable to recall a single word of that first meeting as I was quite literally overwhelmed by Rinpoche’s presence. He was one hundred percent present so that, even in my blissful ignorance, I knew with unshakeable certainty that I had met my teacher. According to Tibetan Buddhism the spiritual teacher occupies a place of unequalled importance in the life of the student as it is through the teacher’s guidance along the path that the student discovers their true Buddha nature and ultimately attains complete Buddhahood. Therefore one is advised to examine a potential teacher very thoroughly so that one feels able to trust him or her with one’s life. The spiritual path is strewn with false prophets and clever talkers, but when in doubt, follow the old maxim of judging a person by their actions rather than their words. Fortunately my first impression of Akong Rinpoche has been more than born out in the subsequent fourteen years of our relationship, though I strongly suspect that I have still only witnessed the surface of the limitless ocean of his wisdom and compassion. Ani Rinchen Khandro is a life ordained nun in the Kagyu lineage of Tibetan Buddhism. She is based at Kagyu Samye Ling Monastery and Tibetan Centre in Scotland where she has lived for the past fourteen years, apart from the three and a half years she spent in closed retreat on Holy Island. She recently wrote a book in honour of the Centre’s fortieth anniversary, entitled Kagyu Samye Ling – The Story, available for purchase online. merci pour ce partage , je viens d’apprendre le décès de ce grand maître tibétain , Akong Tulku Rinpoché , j’en suis trés triste , et j’éprouve une grande gratitude pour cet être humain exceptionnel qui a tant souffert et a si bien témoigné du travail possible pour transformer celle-ci en compassion et en joie , ce qui a été et reste un grand médicament pour toutes celles et ceux qui cherchent la voie vers la vérité et l’amour !! 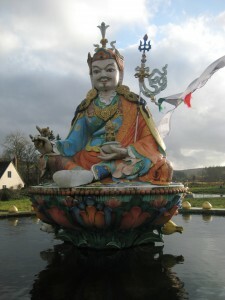 OM MANI PADME HUM .